Since then I’ve sailed her several times. At the very top of this page, in the lefthand corner, there’s a search box where you can key in the word ‘Pike’. You’ll be offered a number of links taking you to articles about her. 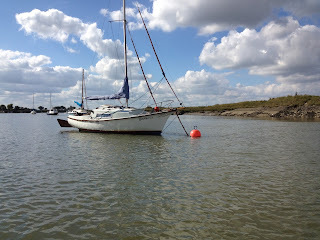 Likewise, if you are interested in a particular boat, you can try searching for her. 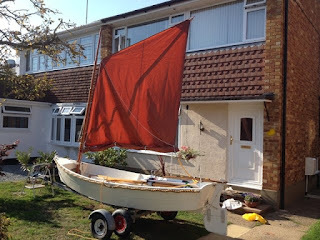 Two months have passed since I had my first sail with ‘Pike’, and in addition to writing about her, I’ve posted articles with details of 24 other boats. Links to them are set out below - the most recent is at the top. 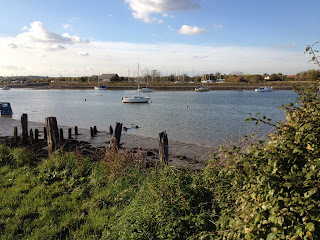 In the absence of inspiration for posting an entirely boat-centred article I’m offering four photos depicting views over the River Crouch at Hullbridge. They portray the mood at the time. There was a gentle breeze, sufficient to slightly ruffle the surface of the water, but not enough to unduly distort* reflections. Overhead, high in the sky, there were wispy plumes of ice crystals, formed by vapour from passing planes. 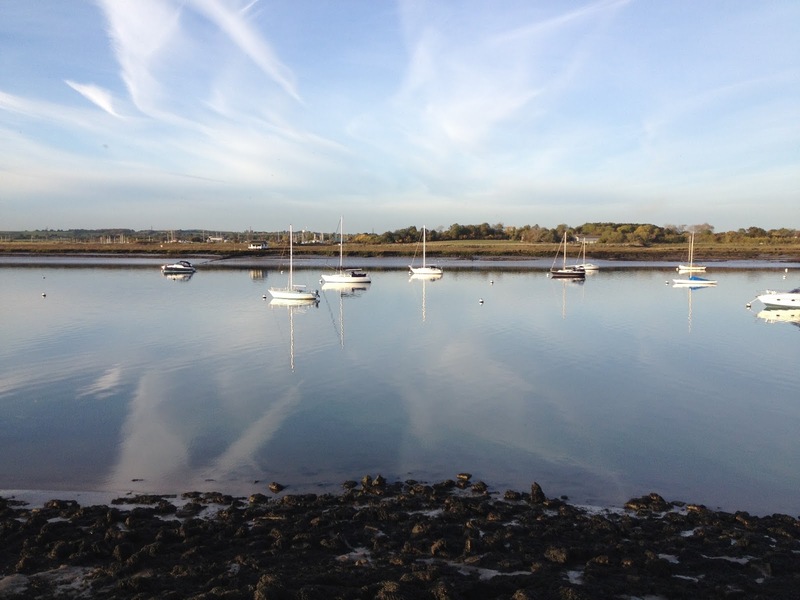 Moored yachts lay in line to the last of the ebb, except for a handful that were caught in a back-eddy** over nearby shallows. Generally, there was a feeling of tranquility. 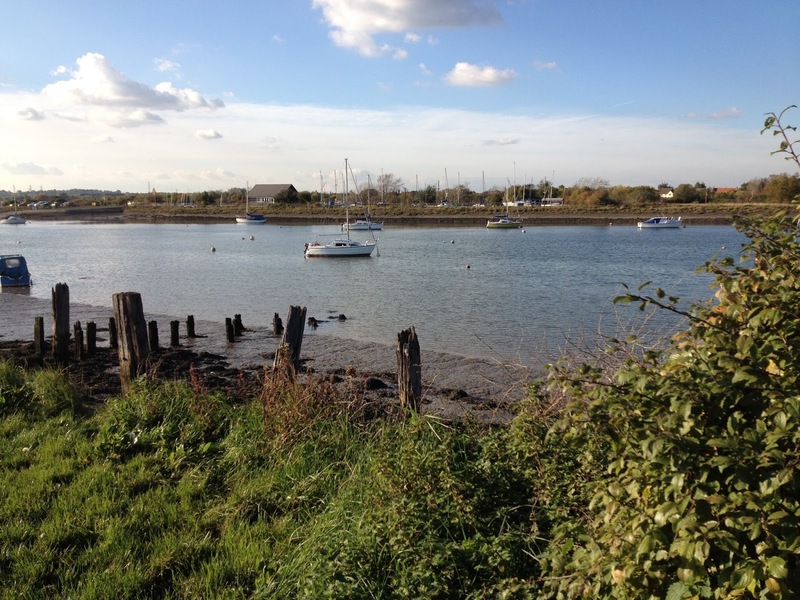 I am mystified by the apparent absence of swans, because they flourish at Hullbridge. 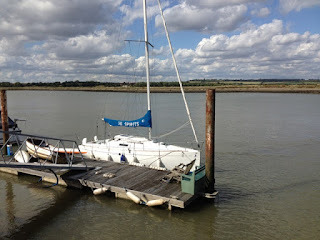 When I was rowing on the River Crouch not so long ago and I came across this Privateer 20. 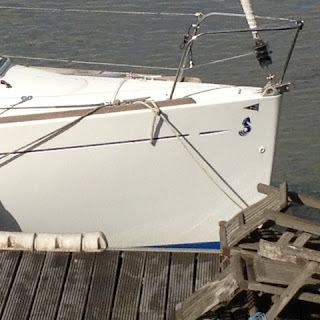 She was designed by Norman Howard who also designed the Shipmate Senior. * The Privateer 20 is a larger version, but with a clipper bow. Both boats have centre-plates and kick-up rudders. 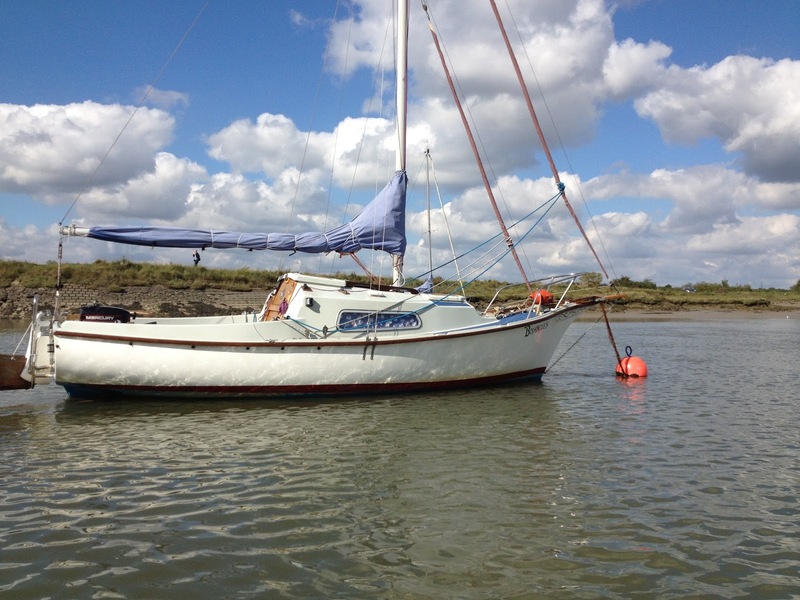 Built by Smallcraft of Blockley in the early 1970s, the Privateer could be rigged as a sloop or as a gaff cutter. The more rakish and attractive to me is the latter. 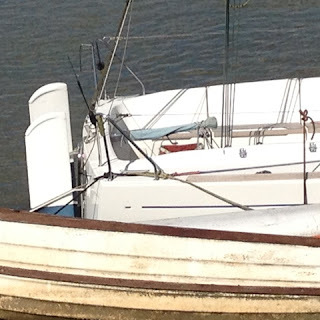 Incidentally, Tony Smith (Creeksailor) rigged his Shipmate Senior** as a gaff cutter. Apparently the conversion from Bermudan sloop turned out to be very successful. So often when walking along paths beside the River Crouch, I look ahead and I look up. Now and again I look down to avoid stepping on dog’s pooh! 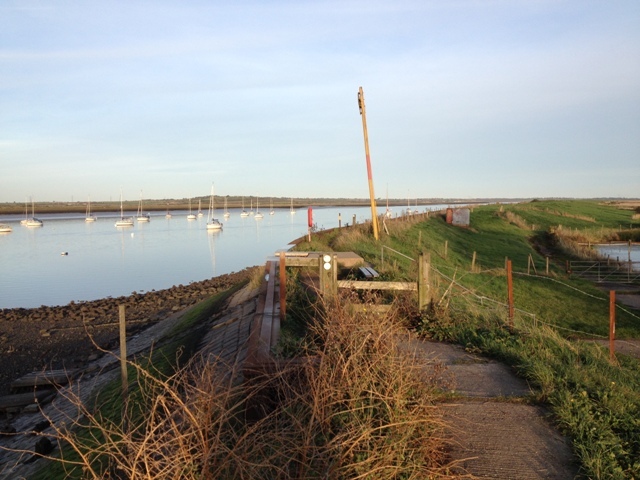 These paths are very popular with dog lovers because there are no restrictions. Most owners are responsible and take heed to control their pets, but a few allow them to run free. Many a time I’ve had dogs bounding towards me without their owners taking a great deal of notice. Two or three times dogs have jumped up to place their paws on me, in the hope they will get a friendly greeting. I like looking at dogs because they come in all shapes and sizes, but that’s as far as it goes. In fact, dogs, as far as I am concerned cannot be trusted. Dog owners will be tut-tutting (barking-mad) here, but if you’ve been bitten by one as I have - twice, you may see it from a different viewpoint. There may be exceptions with well-trained dogs controlled by their owners, but there’s never a year passes without a child is mauled by a dog. Don’t get me wrong, I’m not against having dogs as pets, and I’m all for them being used to help blind people and wherever they can be of assistance, such as with the emergency services. Owners can get great satisfaction from training their dogs, loving them and caring for them. A dog can be a comfort to an elderly person, especially if he is isolated and lives alone. There is the well-known saying, ‘A dog is man’s best friend.’ I am aware of how faithful and how knowing they can be. They are intelligent animals. After this rambling about the canine species and the relationship between them and us (me), I’ll get to the point: Looking down is something that should be done more often. 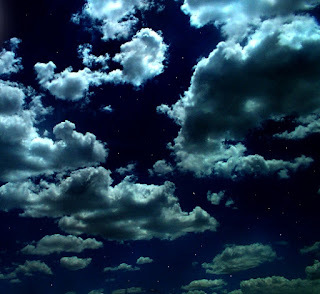 Sometimes our heads are so high in the sky we miss treasures at ground level. Perspective down there is entirely different. One enters a domain that is not often frequented. The lower region is populated with insects, beetles, slugs and snails. These creatures depend upon their immediate environment for sustenance and shelter. At the path’s edge there are a multitude of plants that are ideally suited to sustaining the myriad of insects and animals that inhabit them. These creatures crawl on them, eat them, lay their eggs on them, shelter in them, live and die in them. Spiders weave their webs for trapping flies, moths, butterflies and the odd bee now and again. I’ve seen lizards there and adders too, as well as slowworms. The tapestry and variety of plant growth at the river’s side is amazing, sometimes beautiful. I’m not an expert at identifying them, but I do know of more common types like bramble, hawthorn, alder, ash, thistle, celandine and daisy. 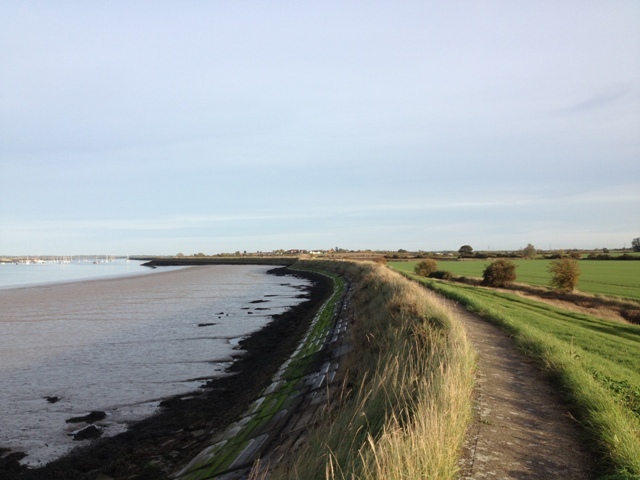 My photos illustrate some of the plants to be seen in the locality of South Fambridge, including a delicate lichen-type growth that clings to the surface of the concrete path. 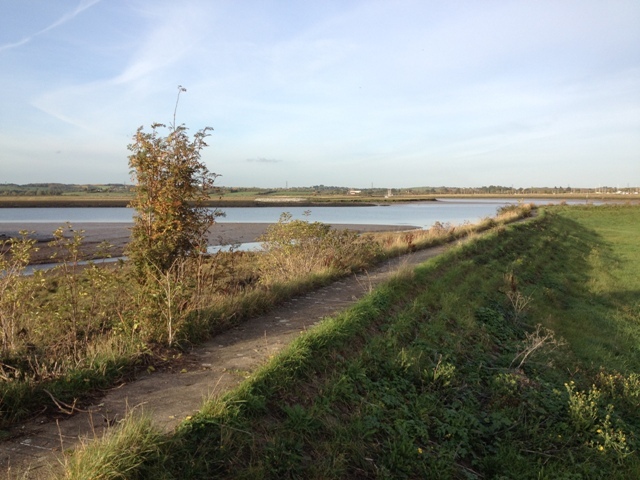 A little further to the east of Hullbridge is South Fambridge, which is my favourite location for taking a walk. There is no other spot I would prefer to be for a quiet time, a moment of refreshment, and this afternoon I had the privilege of doing just that. Apart from a few dog walkers, the place was virtually deserted. I never cease to be amazed at the beauty of the scenery; much of it having been shaped by the hand of man. From atop the flood prevention embankment, I looked to the south, where there were acres of freshly ploughed fields made ready for the sowing of seed. 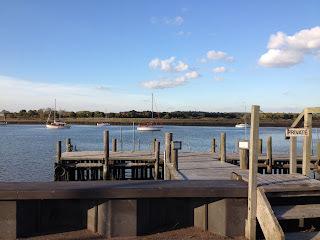 In the opposite direction, across the river, I could see the pontoons of Fambridge Yacht Station, and the wooden structure of the yacht club building. 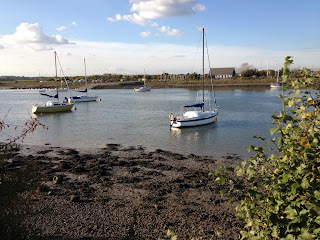 I walked westwards and feasted my eyes upon the beauty. 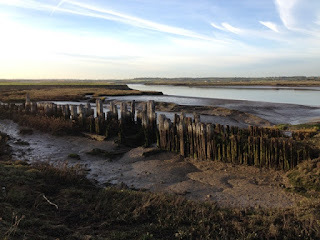 The colours of reflected light from mud and water were a great delight. 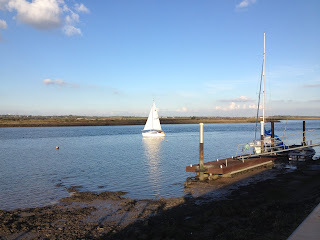 The sensation of quietness was made quieter because of the occasional cries and screeching of wading birds. High in the sky, silently, planes left telltale trails of feathery vapour. I was free to dream and commune with my Maker. 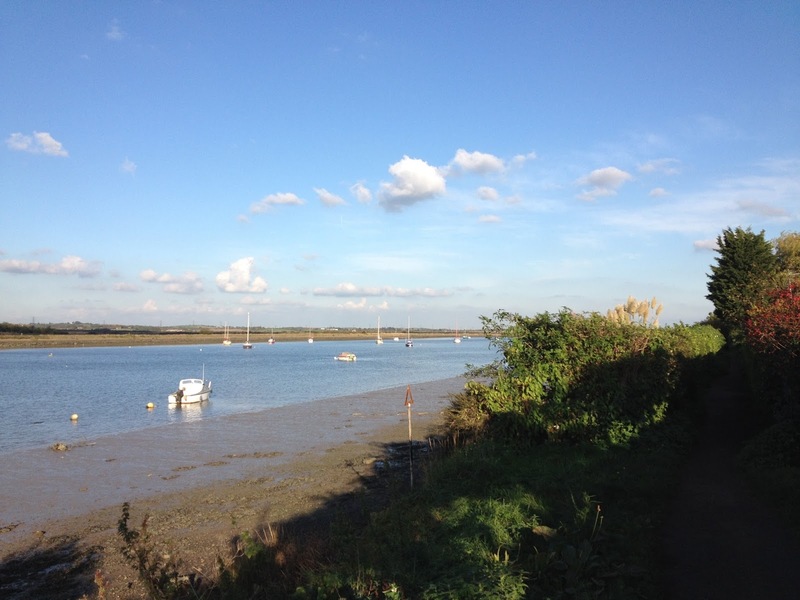 Many readers will know that I love walking beside the River Crouch. South Fambridge is my favourite spot, and a close second to it is Hullbridge. South Fambridge is less frequented by walkers; although in recent years, since the path has been concreted, and nearby, new houses have been built, the path has become more popular with walkers, particularly those who have dogs. To me, the environs of the Crouch have always been beautiful. There’s a sense of space with wide open vistas, lots of sky, and the mood changes with the seasons. There’s never a dull moment. 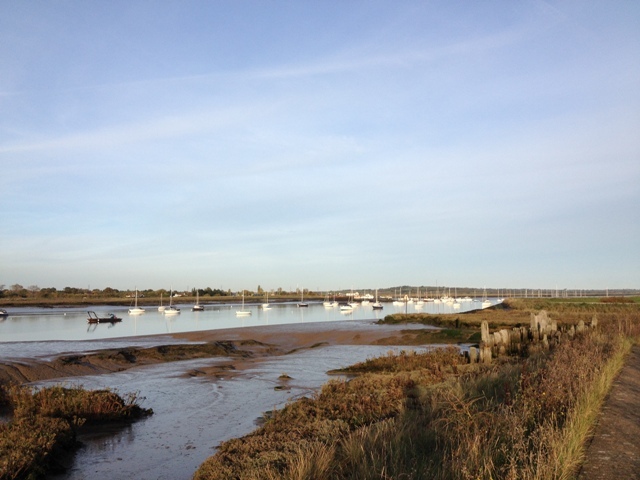 Weather, wind and tide, wildlife and human activities are forever changing. 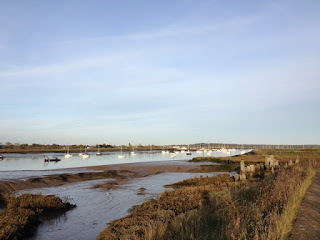 It’s a lively spot, a mind and soul-inspiring location, a respite for dreaming, and for me a place where I feel close to God, not that He is ever far away. 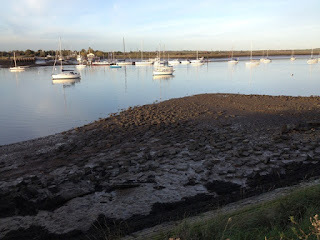 These photos were taken at Hullbridge where the river narrows. Beside the path to the south, there are caravan homes. 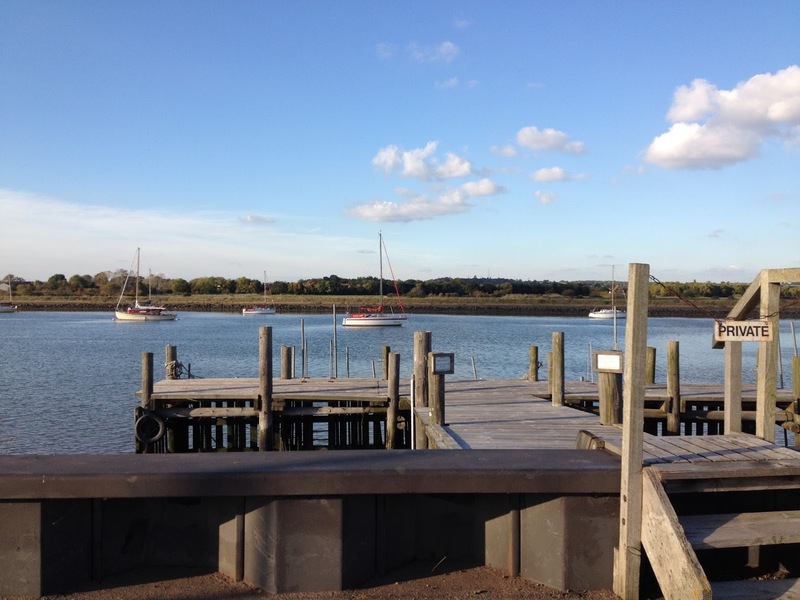 Eastwards, and before Brandy Hole Yacht Club, there are luxury homes with panoramic views overlooking the river. The walker can enjoy these vistas for nothing, and exercise the body at the same time. Since then he has designed many yachts* and he has received worldwide acclaim** for his work. 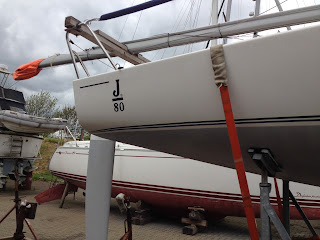 Following on from yesterday’s article about J 80s, here is a smaller, but similar ‘flyer’ at 23’ 8” LOA. 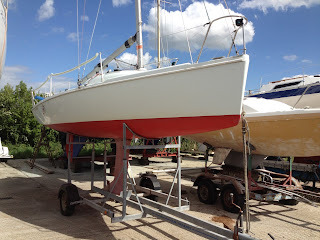 First built by British Hunter Boats in 1995, the 707 is a one design keel boat. She came from the board of David Thomas who also drew the lines and construction plans for the his very successful Sonata and Impala, both of them manufactured by Hunter. A bit of ‘googling’ revealed several links to websites offering information about Hunter 707s. It wasn’t difficult to discover who the owner of ‘Little Red Rooster’ was, not that I deliberately sought him out. His name popped up in racing results published by a certain yacht club at Burnham-on-Crouch. 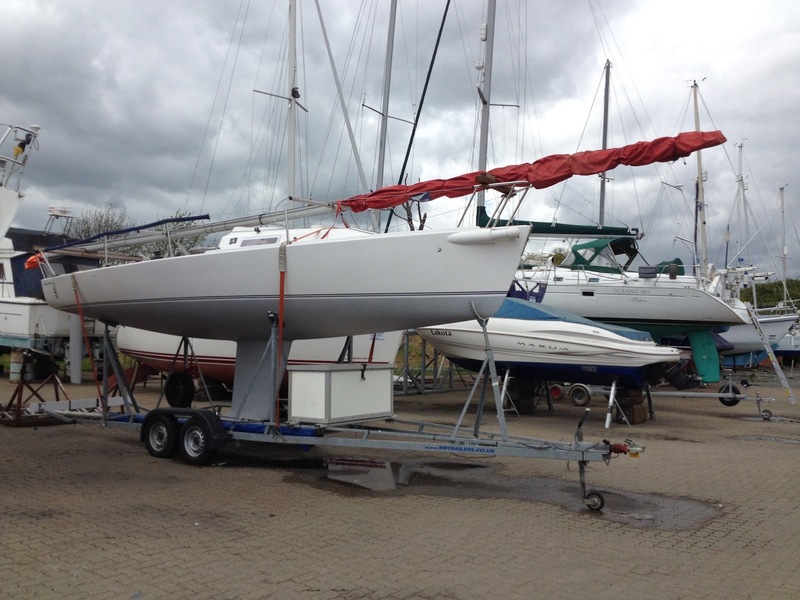 Hunter 707s will appeal to the sporty sailor who enjoys racing on an equal basis. Being a one design boat, they are almost identical, apart from minute differences that may have occured during the manufacturing process. All of them must conform to the Hunter 707 class rules before they can be raced in official events. They are able to take up to five crew members, which can be helpful when conditions are boisterous, because they can act as mobile ballast for trimming the boat. 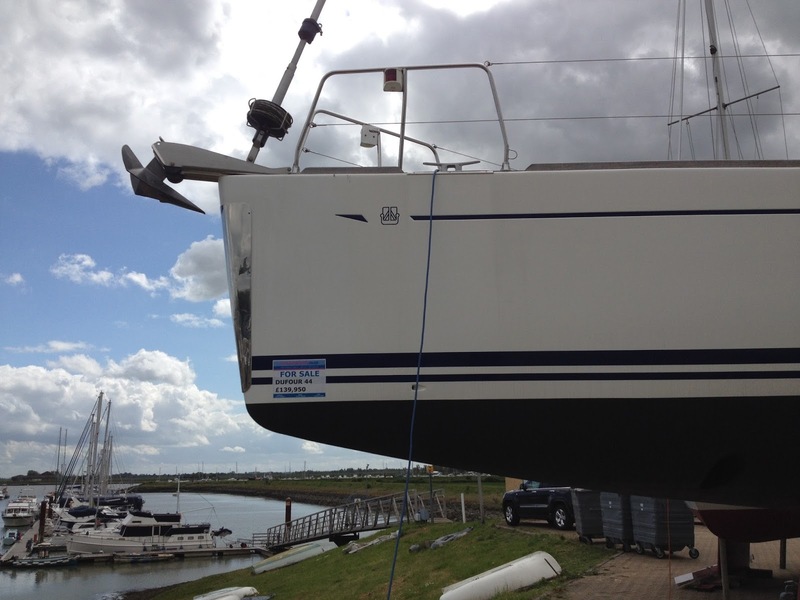 In less windy conditions, fewer crew will help reduce a boat’s actual displacement and reduce her wetted surface for optimum performance. 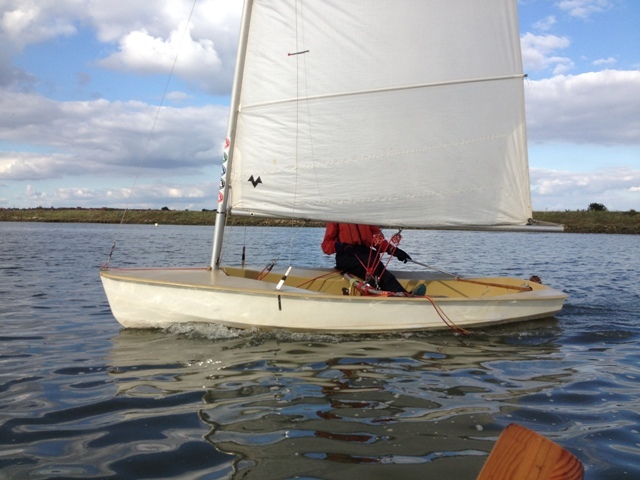 As with the bigger J 80s, 707s are excellent for family day sailing. 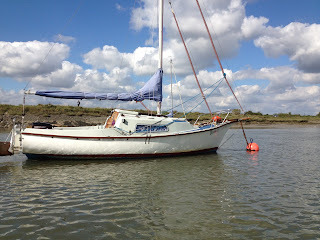 They can also be cruised by hardy types who make light of her minimal facilities and accommodation. 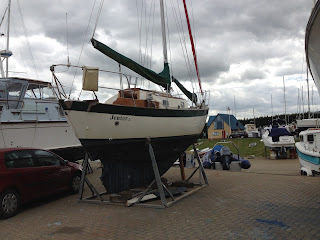 They have been used by Banff Sailing Club and the University of St Andrews Sailing Club for tutoring beginners. Apparently they are excellent boats for match racing. 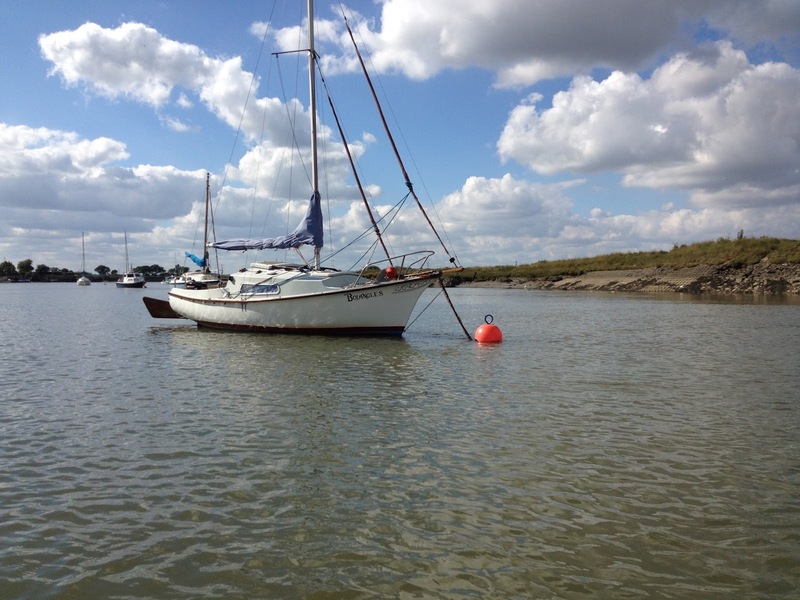 A fixed draught of nearly 5 feet may limit where they can be sailed, and they must be kept on a deepwater mooring. 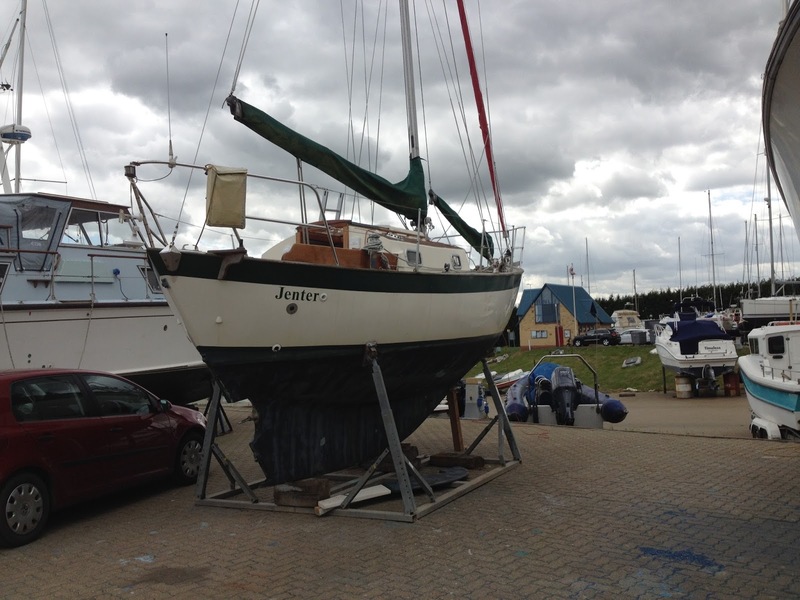 A YBW Forum commentator said his 707 engine arrangement was better than the one with his current boat, a Jeanneau Sun 200. 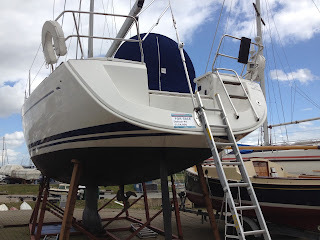 If I remember correctly, Hunter have a system for fully retracting an outboard engine from an access box near the stern of a boat. The J 80 is described at the J Boat website as a sportboat. There’s no such word in an English dictionary; therefore I guess it is an Americanism, but the word conjures up a vision of an exciting yacht designed for competitive racing and for exuberant sailing. On-line photos, videos, descriptions and accounts confirm she is such a yacht. She is raced internationally with large numbers participating. 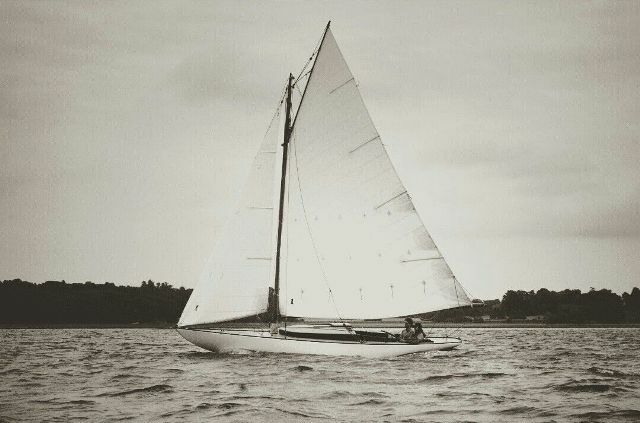 62 boats competed in the J 80 World Championship at Newport when conditions were challenging because of strong winds and white-capped waves. Sailors and their boats from 9 countries took part. A function she is suited for other than racing is family day sailing. She is reputed to be easy to handle, sea-kindly and capable of being sailed offshore. 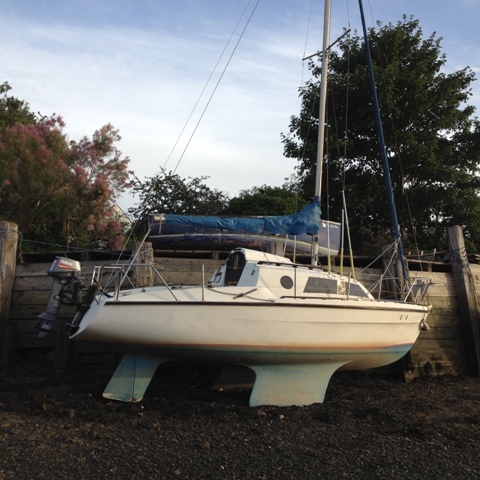 * Her 1,400 lbs fin keel gives her excellent stability, and because of her light displacement and slippery hull she can sail at 19 knots** when conditions are right and she is being handled by an expert crew, but this is definitely not for the fainthearted! 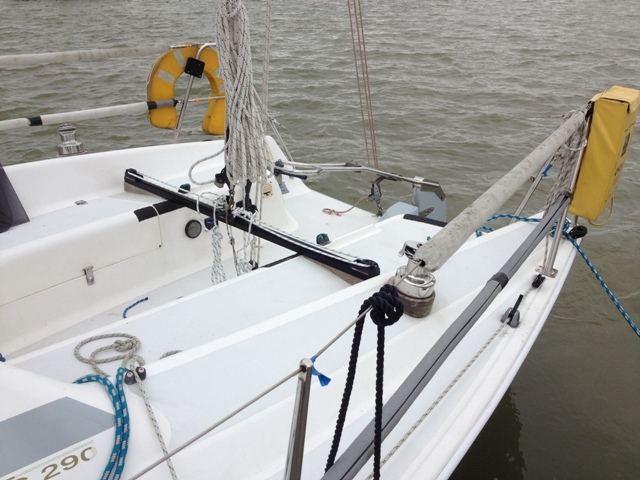 *She meets the EU Recreational Craft Directive’s Design Category B able to cope with waves up to 13 feet and winds up to 41 knots. 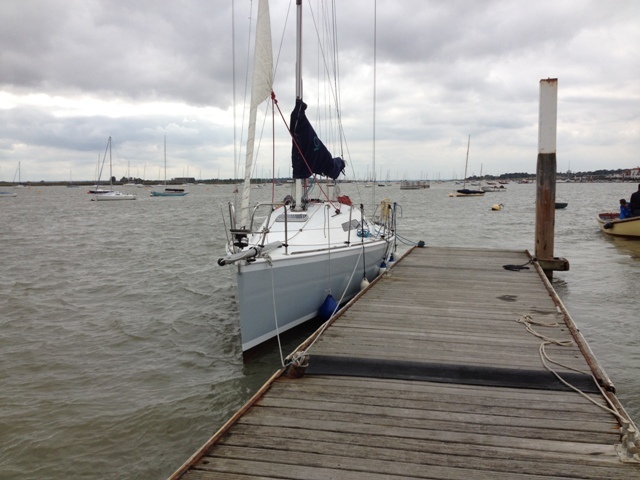 **Extreme Sailing 19.6 knots on j80 - Yeehaw!!! This sort of yacht is way-out of my league, and as such she is a bit jaw-dropping. 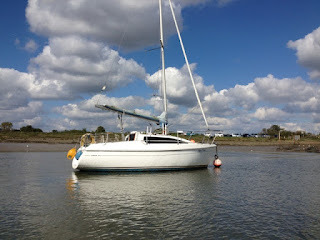 In May when I took photos of her, she was on the market for £139,950. * It’s possible to buy a small terraced house for that amount. The sort of person who would be interested in owning her, most likely would not be in the least interested in a terraced house, unless he was into buying it to rent or to renovate for selling at a profit. Anyway, I digress - back to the yacht. 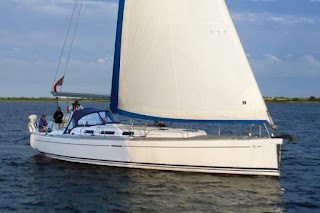 She was designed by Umberto Felci and Patrick Roséo, and she was manufactured in France by Dufour Yachts. 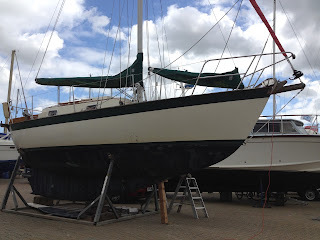 44s were built between 2003 and 2008, but I don’t know the date when this particular boat was built. She looks as though she is a shallow draught version at 1.76 metres. Deep draught 44s draw 2.31 metres. They are described as ‘performance cruisers’, which indicates they have a good turn of speed on all points of sail. Having a fractional sloop rig with an in-mast furling mainsail and a furling Genoa, she can easily be reefed, while remaining well-balanced. Her interior borders on the luxurious with twin aft cabins and an owner’s cabin up forward. She has an ‘L’ shaped galley, a navigation station, a spacious saloon with ‘U’-shaped seating around a central table, twin heads, loads of locker space and a powerful diesel engine, all of which comprise a package that would make many an owner satisfied with his lot. *The Dufour 44 Performance advertised below** has an asking price of £124,950* Therefore I don’t think she can be the same boat as the one I photographed, because the cheaper boat has bow thrusters. I’ve been saving for a new computer for well over a year, and today I took the plunge and bought myself an iMac. Most of my computing to date has been with Microsoft Windows, but I’ve had an iPhone for several years, and more lately I bought an iPad; therefore it seems logical to go the whole hog and make it a trio! 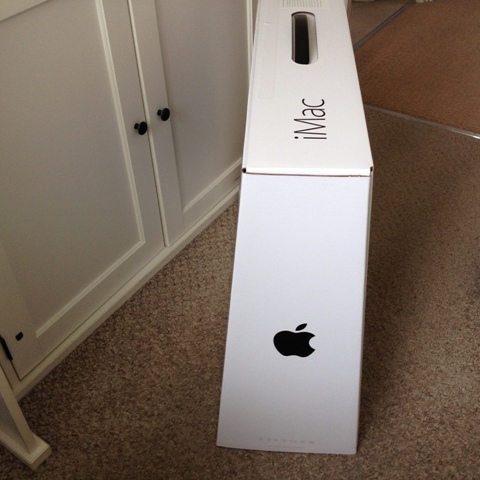 That brings a problem, because I’ll have to learn how to operate the iMac. Fortunately there are similarities between it and the iPad and the iPhone. To complicate the matter, the latest (2016) keyboard has a slightly different layout to that of my Dell Studio laptop. The ampersand ‘@’ symbol has been moved to the #2 key, which it also shares with the Euro symbol. The ‘control’ and ‘fn’ keys have been exchanged, and there are two ‘command’ keys. Not only are there differences between the keyboards, but there are differences with the layout, and content of the homepage. Even document applications are different. I don’t really want to buy ‘Word for iMac’, but if the push comes to the push, I will. The reason why I am letting you know these things is to inform you that I may have difficulties in uploading my blog for a few days. I’ll have the old computer as a standby, but I don’t want to be using different machines concurrently. I’ll see how it goes. Meanwhile, please be patient. 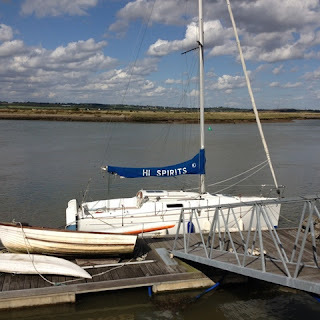 I saw this boat on 28th August moored to a Rice and Cole pontoon at Burnham-on-Crouch, and I was attracted to her clean, streamlined appearance, giving the impression she was very swift. 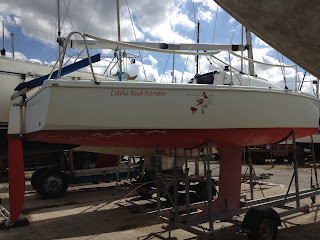 She could be described as racer/cruiser, with more emphasis on racing than on cruising. This class of yacht was designed by Pablo Matracchio and built in Argentina. 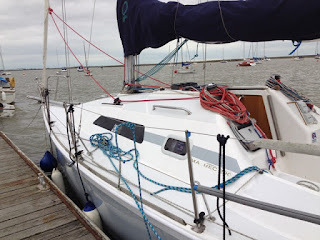 All control lines are led aft, and her self-draining cockpit is large enough to accommodate a crew of six who will have little to do when racing on the river, except to be mobile ballast and trimmers of sails. 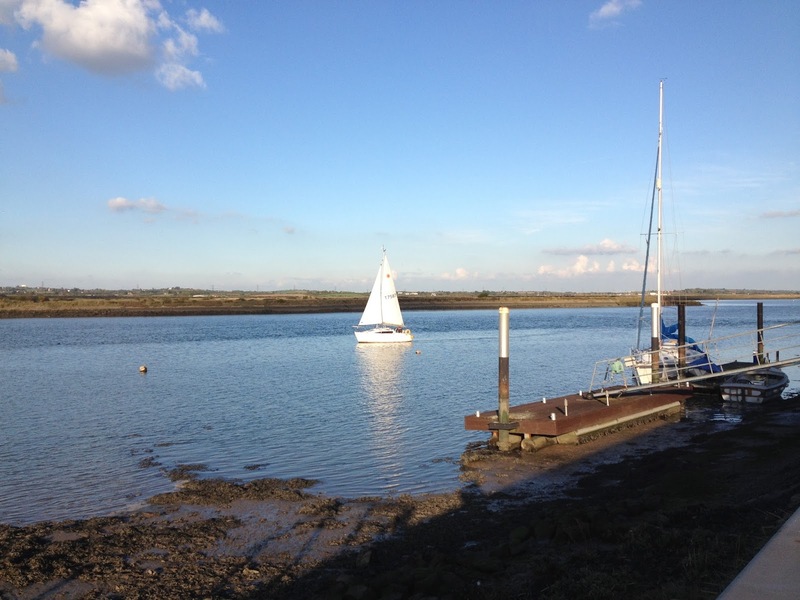 Prolonged coastal racing would require more effort, including doing the navigation, watch-keeping, preparing meals, cleaning up and general chores. 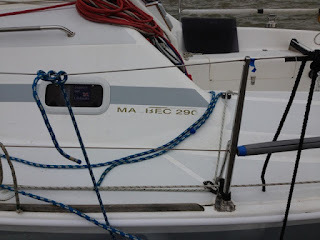 Assuming she’s the Malbec 290 for sale* at Rice and Cole, her internal mouldings have built into them a galley to port with a sink, and a heads and a shower to starboard. In the aft cabin there’s a double bunk. She has a Volvo 15 HP diesel engine. Altogether she’s an attractive package for someone who is willing to part with £30,000. What can I say about this boat seen at Hullbridge? She’s similar to her smaller sister, the First 211,* but with far more of everything – space, power and speed. I don't know what sort of engine she has, but First 260s can be powered by an inboard diesel engine such as a Yanmar 9 HP 1GM10 with a folding prop. 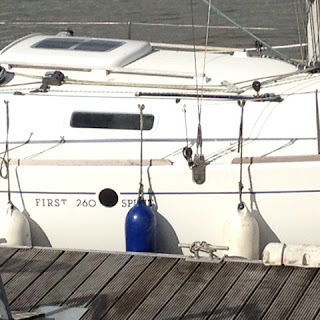 The video ‘Beneteau First 260 Tour’ **gives the viewer a good idea of her interior. 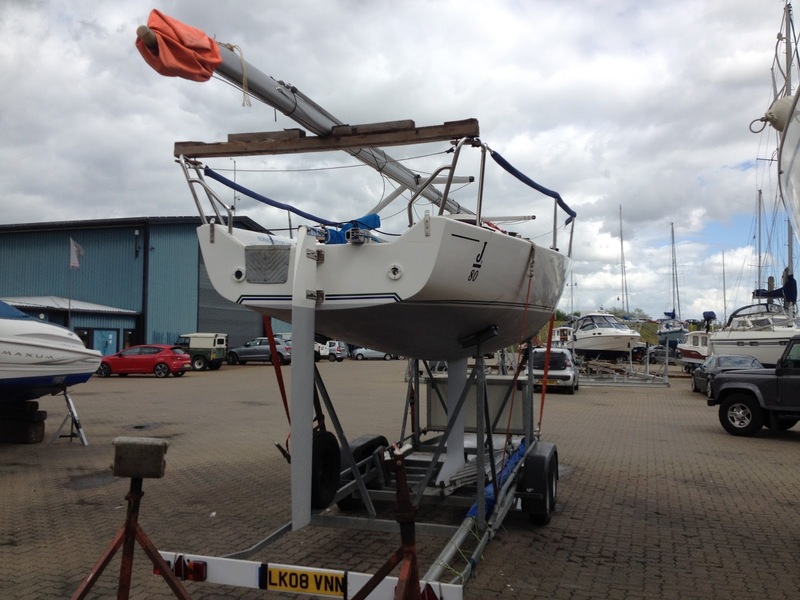 This attractive 25’ 3” X 9’ 1” lifting keel yacht will surely give her owner a lot of fun. She offers the best of everything: performance, combined with shallow draught (2' 9") when the keel is in the raised position. The Used Boat Test*** by Sailing Today provides more detail. What is the greatest commandment of God? It is recorded in the Gospel according to Matthew, Chapter 22 and Verse 37: ‘Love the Lord your God with all your heart and with all your soul and with all your mind.’ The other synoptic gospels of Mark and Luke add the words, ‘and with all your strength.’ (Mark 12:29; Luke 10:27) Inclusively, the greatest commandment is for every part of our being - our thoughts, our desires and actions; they should be God-centred in love of Him. How should we love Him? - By being obedient to Him. 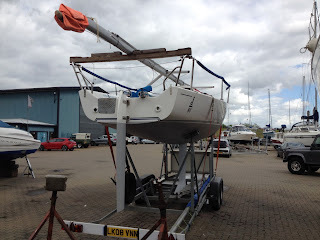 What has this to do with us who love boats? 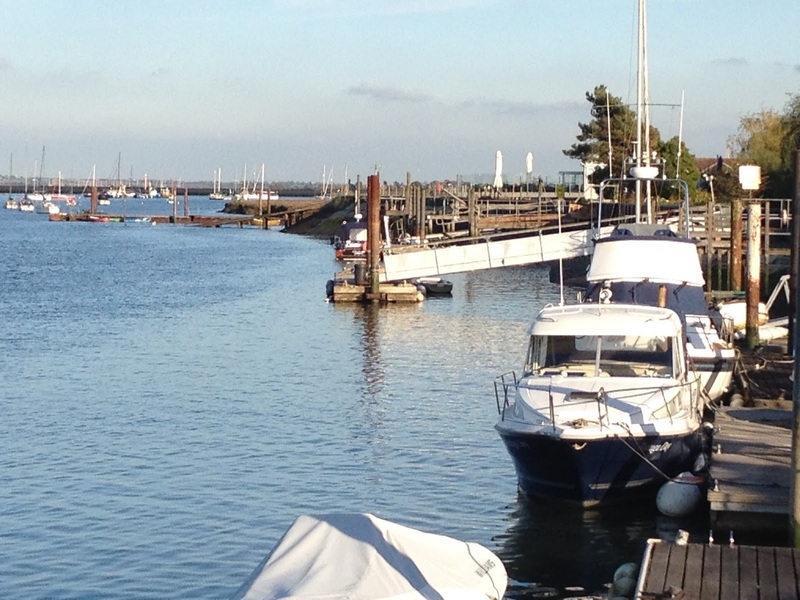 A great deal, because it should show us the contrast there should be between the type and quality of love we have for boats and that we should have for God. The two loves are on entirely different levels. One is intense and eternal, while the other is insignificant by comparison, and temporary. 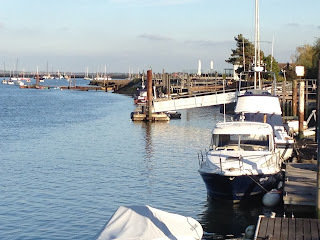 Bear in mind that I speak as a Christian, and I know that many will not see things as I do, but if you are a lover of boats you will have an understanding of what attracts you to them. I appeal to you who do not know the love of Jesus to search for an understanding of Him by searching through His word, the Bible, and by seeing His beauty in His creation, the mighty universe, heaven and earth. Look beyond the temporary to the eternal and know His love.